Rushden is a tiny village of about 200 population located in North Hertfordshire. Many of the properties date back to the 16th century and there are a few ghosts that wander around every so often. No shops are left, but we still have a church and a pub, both of which are at the centre of the community. Parish Council Annual Assemble, is on Wednesday 24th April 7;15pm for 7;45 in the Village Hall. Big turn out wold help! Coffee Morning Thursday 25th April, 10am to noon even bigger turn out would set the "Cats" among the Pidgeons. Pub Night Friday 26th April from 7pm in Village Hall I sometimes fear to ask will any outside the normal dozen turn up? "Village Tidy" Saturday 27th April Village Litter pick from 10am to noon. "Gear" available at village hall about 9.45. I will be on the bit from Lye End toward the A10. Also On Saturday 27th April from 10am too 2 pm its Doughnut Day 10am to 2pm @ 4 Dark Lane. The non emergency number for contacting the Police if you have worries about anything is:- 0845 3300222. Please start thinking if you would like to be involved in an extravaganza. Thank you so much to everyone who braved the weather on Sat 9th March for the churchyard clearing. It is much appreciated. The next one will be on Sat May 11th again in the churchyard and inside the church. Here are some photos of the excellent quiz night we had on Saturday 16th March 2019. A big thank you to all who organised this for us. On Wednesday 13th March, Village Link had a speaker from Nazing Glassworks. SANDON GARDENERS' CLUB meets every 2nd Monday of the Month at Sandon Village Hall at 7.30 p.m. although we sometimes have outside visits. If you have an interest in Gardening come along and join us, new members are always welcome. 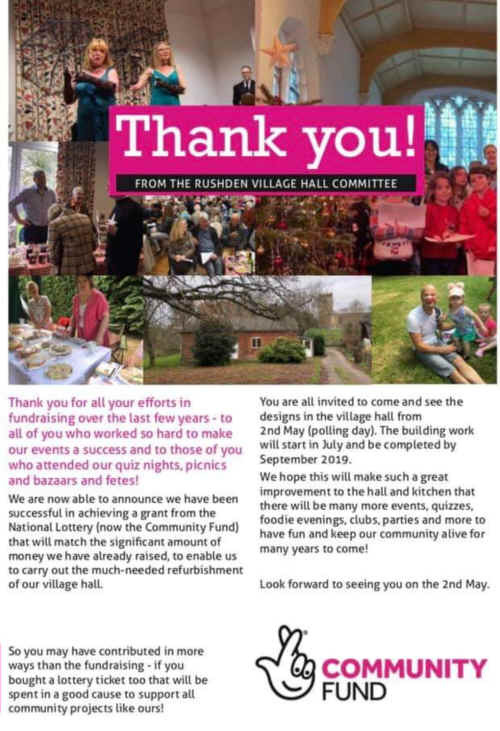 Once again we had a very nice village event, the bazaar. Lovely food and drink, games, raffles, decorations and craft items. Such a lovely variety. Thank you so much, all of you who worked so hard to make such a nice event. Thank you very much for the banner you presented us with on Wednesday at the Village Link. We have placed it in our church until Sunday, which is the last day of the Remembrance period. Christmas at Buckland Barn open everyday 9-6, and 10-4 on Sundays. Free bag of eight hour tea lights with a £20 spend.SG9 0PS . 01763272549. With HUGE thanks as ever to everyone who helped make the Fete another successful and social event. We’re so grateful for all the hard work and effort and then for adapting to the Black Barn because of the weather- with thanks to Kate and Mark for letting us use it. About £3,400 will have been raised for the church. The flowers there are spectacular and will be on display all this week- do please drop in and admire, we really are lucky to have such talented arrangers. LOST black drone. Took off from Sandon school playing field. Flew across school and Rushden Road THEN disappeared into the distance. IF found PLEASE return to 20. Rushden Road. Many thanks. It was perfect weather for Rushden Fete on 24 June 2018. Two families needing after school and holidays childcare (one for 2 days a week and the other for 3 days a week) from September. Roughly 3.00pm til 6.15pm each day, pick up from Sandon School. One family lives in Rushden the other in Cottered. Children are aged 3,4,6 and 7. Please contact Crissie on 07775931343 for more information. We had a lovely picnic on the village green in Rushden to celebrate the royal wedding. As you can see from the photographs we had a lovely time in the glorious weather. It was perfect weather for our pimms and barbecue. It was a very happy occasion and our thanks go to the organisers of this event. "The results of the year-long feasibility study which apparently will provide the county council with some idea as to what can be done on the road is imminent, but until then we are pressing on with hearing people’s experiences and opinions on the road to keep it in the public consciousness and keep pressure on the council. We'd like your experiences and opinion on the road. The cut-through junctions in the central reservation to the villages seem to divide people, some want them closed as they cause the most accidents, some want them replaced with roundabouts, some want to keep them as it would create longer journey times for people in Sandon for example." 8pm normally every 2nd Thursday night of the month. Bring your own drink and BBQ food- we do the BBQ, and we can all have a good time socialising and/or playing games. Table tennis is most popular, but other games can be arranged if wished. £3 per person per night, to pay for the hire of the hall. Please come along, have fun, and support the Village Hall. Would you like to be included in the Rushden Village oil buying group? Every month Sue Whiting circulates a monthly email inviting you to respond with your name, your address with postcode, the quantity of oil you require and any special instructions e.g. the tank is in the shed. Your delivery will be added to that months oil delivery and benefit from any available group oil buying discount. There is no cost to be included in the group and the oil company will invoice you directly so that you can pay them in your usual way. You can contact Sue at theorchardhouse@btinternet.com to be included on the email. The Children’s Air Ambulance charity have advised that all their collection bags delivered within the village should always have the date for collection stamped on the back. The people who deliver them should always carry ID. Anything suspicious should be reported to them on 01536 480007. What wild thing is that? Our survey forms are ready and waiting. I'm happy for you to send this link out now - on the basis that it is in development! The Moon and Stars now has a minibus to pick you up and take you home if you dine there. So, you can enjoy a meal and a few glasses of wine without having to worry about who's driving! Invite your friends from Buntingford, Baldock and Royston to enjoy the delights of our local pub! We now have available a colour booklet listing all the gravestones and memorials in Rushden churchyard and the church itself. This has been prepared by Hertfordshire History Society (Hoddesdon group) and also contains a history of the church, a detailed numbered plan of the site with full inscriptions and alphabetical appendix. 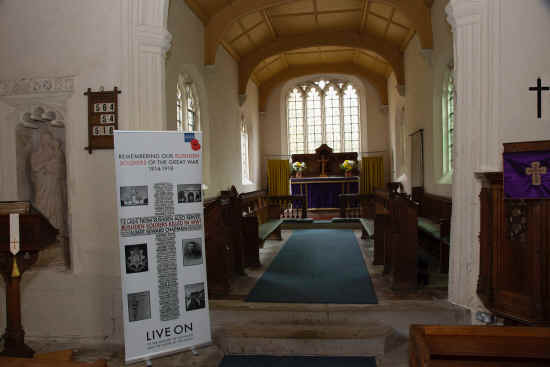 The booklet also contains similar information for Clothall Church and runs to 65 pages. Copies are available for £7.00 each either in the church (with honesty envelope) or by post (£7.50) from C. Whitton at Southern Green House, Rushden, Herts.SG9 0SX. I'm trying to trace relatives of my great grandfather, Amos Mathias Bird, born 1877 in Rushden, Hertfordshire. I believe Amos moved to Southwold, Suffolk when was still a young child. As a young man he was stationed in Ireland as a H.M. coastguard. He later returned to Suffolk and was coastguard at Southwold. I would interested to know who my great grandfather's parents were and whether Amos had any siblings. 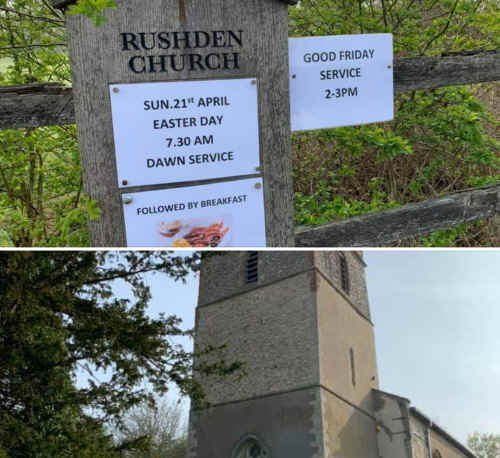 Hoping there is a mention in your parish records or perhaps even a Bird family still residing in Rushden. Formerly of Reydon, Southwold Suffolk - now resident in Bali, Indonesia. Ever had any trouble with BT/Openreach? I am doing some research on landline and internet services in Sandon, and would be grateful to hear from anyone who has had problems. Have your broadband facilities gone down, and have you struggled to get reconnected? Have you been periodically cut off? Been run ragged by poor service? Despaired over customer relations and your ISP's response? Advertising your business in the local parish magazine, SWRC Gazette. We are trying to reach more people for the opportunity to advertise. If you want to promote your organisation email swrc.gazette@googlemail.com if you wish to be included or to receive our current prices for the year. I just found out my roots trace back to Rushden to Isaac Hearn born 1715 he married Ann Jacob 1718 but that is all I know right now. Would you know if there was a way to find out more about these people and if they still had descendants in Rushden. The Rushden Lace Club meets on the first Monday of the month in the Village Hall and all types of lace are made under the expert tuition of Bridget Cook. Beginners are very welcome to join our happy group where tea, coffee and biscuits are supplied but you bring your own lunch. Reliable and trustworthy cleaner/housekeeper, based in Rushden. Good range of services, competitive rates, references available. Please call Sofiya on 07901154847. If the rainwater from your gutters drains into soakaways and none goes into mains drainage you may be entitled to a reduced sewerage charge on your water rates. If you think that this applies to your property it is worth contacting your water supplier (not the sewerage company) to apply for a surface water discount. This is a follow up to a discussion at our first Village Link. It is worth villagers’ while checking it out as they may be entitled to a rebate. Apparently, the charge is always applied regardless! Rest assured that your dog will have at least one long walk a day . Not everyone is aware that we now have our very own wet fish man calling at the Moon and Stars every Thursday at 6pm. He has a good selection of fish and shellfish. (sleeps 4: 2 bedrooms) private pool, pool house, terraces, garden, wonderful views. Full details at www.dubois.me.uk Contact Lilian on Tel: 07941 419859. 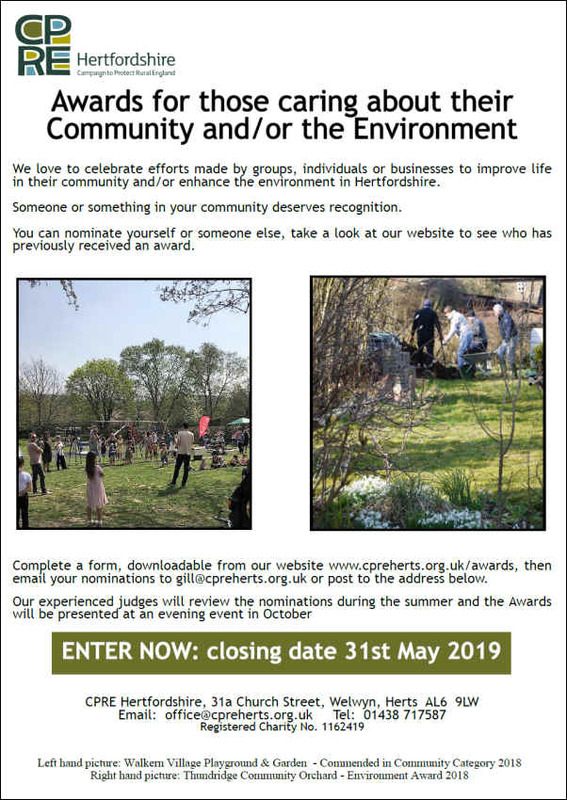 The Buntingford Civic Society are trying to increase awareness of the work of the Society via their web-site. To find out about their activities click here. Here are some numbers that may be of use. 11am to 12.30pm. Entrance is £1 adults, 50p children. Bring along any books you would like to swap and take away to that number. 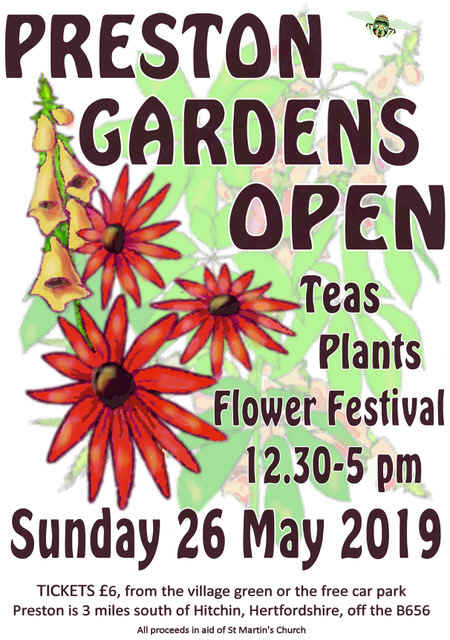 Tea, real coffee and homemade cakes will also be available. Buy your goods from perfiliate on www.buy.at/StMarysRushdenHerts and save yourself money whilst helping St Mary's Church. Rushden is linked with the Hertfordshire Communities Online, British Villages Website, Village Key and Irish and British Villages . Have a look and take a virtual tour of the villages of Britain. This is Rushden's very own website. You can input your views directly onto the Bulletin Board or exchange news and views with all the other visitors on our Discussion Board. Click and just add your own comments about what you feel is good, bad or indifferent about Rushden, the government, the world and life in general. This is our community website for our community. 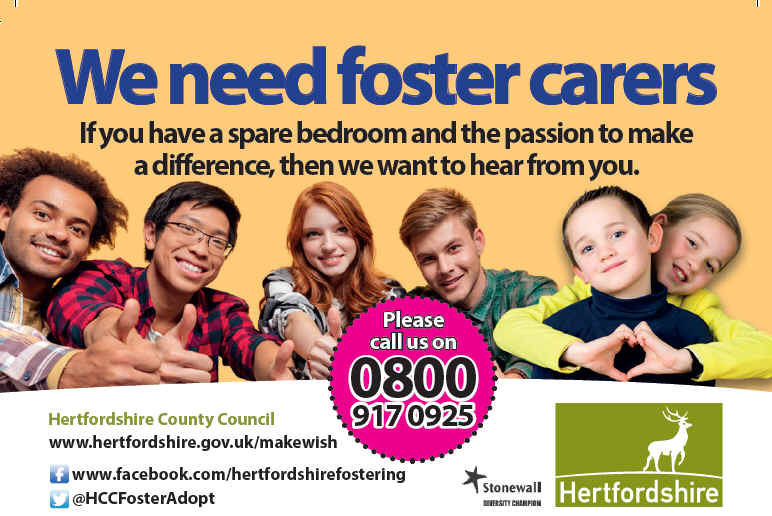 E-Mail the Webmaster@rushdenherts.org.uk with all your news, comments and suggestions.